Ruby J Murray’s decision to base her latest novel around a young woman in Geelong is something she has wanted to do for a long time. 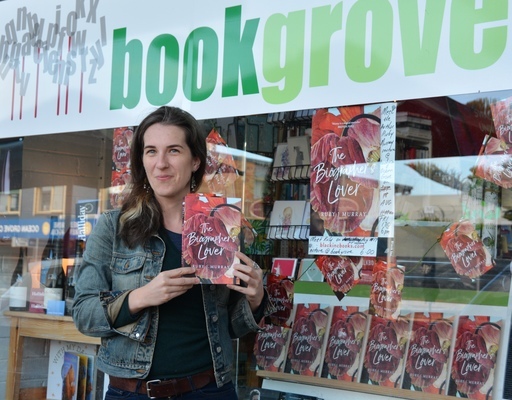 The Biographer’s Lover, which has been released to positive reviews, is about young writer who is hired to put together the life of an unknown artist from Geelong. She thinks it will be just another quick commission paid for by a rich, grieving family obsessed with their own past. But the artist’s work spans decades, raising more questions than it answers. “There were some things I knew I wanted to be included straight away,” Murray says. “I knew I wanted it to be in Geelong just because there aren’t many books set in Geelong and this part of the world and that was very frustrating for me. Murray now lives in Oakland, California, with her husband, but vividly remembers growing up and spending holidays and weekends at her father John’s place in Queenscliff. “It was so busy in summer, it was packed and almost like you were in a fairground,” she recalls. Murray says she has been writing her entire life. “I didn’t want to be a writer career-wise because I thought it was a bad career decision,” she laughs. Instead she studied political science and worked in international development in Indonesia. The Biographer’s Lover took Murray five years to write. “I wrote the book that I wanted to read,” she says. “I’d be delighted if it reached an international audience, but it wasn’t the plan. “I hope it makes people think about how history is told and who gets to tell it because when I was growing up it was almost as if women weren’t part of history at all. “There were no female narratives at all. Murray will launch The Biographer’s Lover at Bookgrove in Ocean Grove on Friday night.